Fáilte romhaibh go suíomh Gaelscoil Mhuscraí áit a bheidh eolas mar gheall orainn comh maith lenár nuacht agus grianghrafanna is déanaí. Is gnáth-bhunscoil chomhoideachsúil, Chaitliceach í Gaelscoil Mhuscraí a fheidhmíonn faoin bhForas Patrúnachta agus faoi ghnáthrialacha na Roinne Oideachais.Ta súil againn go mbainfidh sibh idir taitneamh agus tairbhe as ár suíomh scoile agus as an eolas agus léargas a thugann sé ar shaol na scoile. 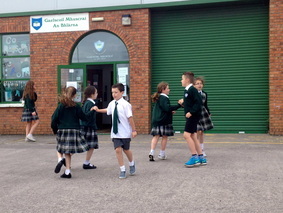 Gaelscoil Mhuscraí is the Irish medium primary school in Blarney. The school is co - educational and Catholic and operates under the patronage of An Foras Pátrúnachta and under the rules and regulations of the Department of Education and Science.Welcome to our school website where you will find information about our school as well as our latest news and photographs. We hope you enjoy learning about life in our school.